Kenneth, if you have two different sized hoses to the remote, it's pretty likely that you have a single acting circuit. The smaller hose would be the pressure side, and the larger hose would be the return side. On smaller excavators these were extremely common since they would be used only for things like hydraulic packers or demolition chisels to break up side walks or roadways. It is however VERY easy to add a 6 port 2 way electric valve in there to give you a two way circuit or two. Again, thanks Murf. It only made sense with the two sizes that would be the set up. I must be missing something here--It doesn't make sense to have just one line going to the bucket area as an aux. circuit. Kenny says single-acting which would mean that pressure is released in a cylinder and its circuit but then has to rely on gravity, weight, or spring pressure to return the cylinder. I can't think of anything that uses just one line that would be used on a small excavator. As far as size of lines go, on my regular flow 18-GPM skid steer bobcat the aux. lines are the same size. Eevn if it had hi-flow of 27GPM they use the same lines, but change the fittings. Where's Joel when I need 'em to keep me honest? Was'a'matter there Jeff'ry, that 45° heat gettin' to ya' now? If the attachment on the remotes is something like a packer which is basically an offset (out of balance) cam on a motor, it only needs continuous flow to work. A thumb certainly could be used, as EW mentioned, provided a return spring was used to pull it back open, but you would still need another valve to hold or release the fluid back out of the cylinder when you stopped feeding pressure to it. Murf, I was being rhetorical. What I was getting at was Kenny was mincing terms (again): single acting vs. single circuit, double circuit vs double acting. 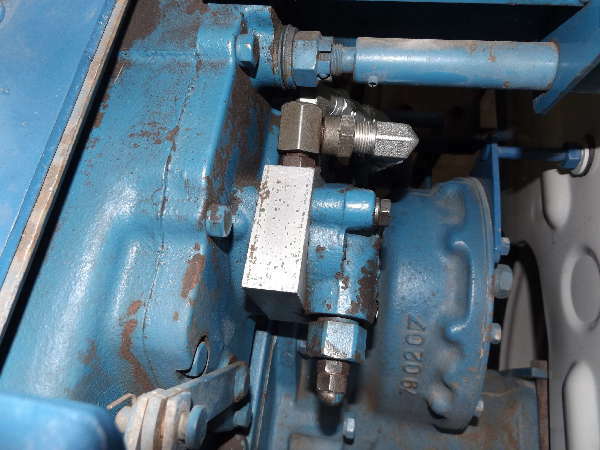 Kenny, a "single circuit" most could mean two things: like Murf says for a breaker, compactor (hydraulic motor that DOES NOT change direction) then it could be set up to run those types of accessories. However, if you CANNOT change direction in that particular circuit (either in/out, left/right, forward/backward) then you CANNOT use an auger, thumb, directional boring head, etc. To me, it sounds like if you have a single circuit that has one line bigger than the other, like Murf said, that is a return line (due to heat expansion), it sounds like it is not reversable direction-wise. But anything is possible. Now, if you have a double-circuit that would indicate to me that the machine is set up for something like a forestry harvesting head that has a grapple WITH a power-rotating head that requires a reversable direction for both parts of the accessory. However, if you CANNOT change direction in that particular circuit (either in/out, left/right, forward/backward) then you CANNOT use an auger, thumb, directional boring head, etc. Now here's where ya' lost me. Why couldn't you run an auger or DBH? You wouldn't have reverse, but my PTO doesn't either, and it runs a PHD just fine. I agree, you would need more plumbing to make a thumb work, but just a simple 2 port 1 way valve would be all that's needed as long as you had a spring return or something to open it back up. I know what you meant BTW, I was just pullin' yer leg there ol' son. Murf we're the same age! Or maybe you were calling me that 'cause I'm sooo bright? "Ol Son" is a southern euphemism that implies kinship. Sort of the southern slang version of 'older brother'. Of course, you ARE a little older than me, so "Ol son" is more than fitting.